Transmission networks carry high voltage (HV) electricity long distances across the country over transmission lines which, when interconnected, become transmission networks which are owned and maintained by regional transmission companies. 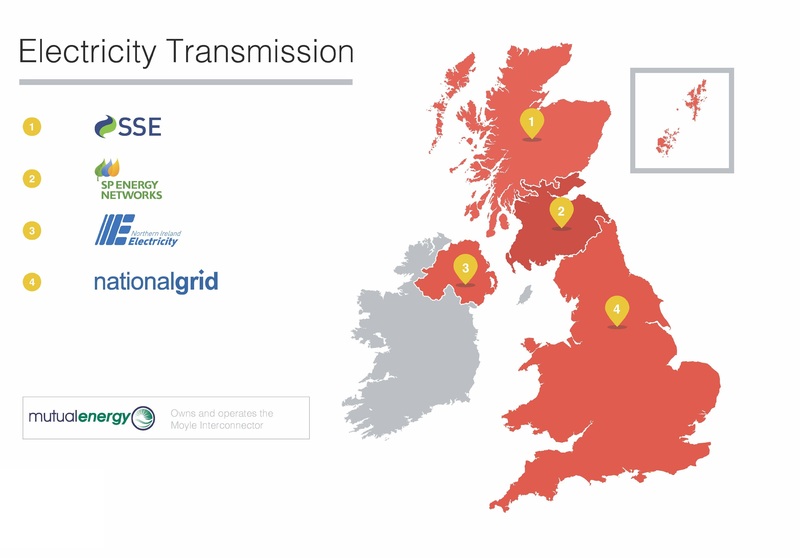 The UK high voltage transmission network is owned and maintained by National Grid in England and Wales, in Scotland the grid is split between Scottish Power Energy Networks for southern Scotland and SSE for northern Scotland and the Scottish islands. The electricity transmission in Northern Ireland is maintained by Northern Ireland Electricity. Most transmission lines are high-voltage three-phase alternating current (AC), although single phase ACis are sometimes used in railway electrification systems. High-voltage direct-current (HVDC) technology is used for greater efficiency at very long distances typically hundreds of miles, or in submarine power cables typically longer than 30 miles. Electricity is transmitted at high voltages (120 kV or above) to reduce the energy losses in long-distance transmission. Power is usually transmitted through overhead power lines. Underground power transmission has a significantly higher cost and greater operational limitations but is sometimes used in urban areas or sensitive locations. Jointing Technologies carries a multi-million pound inventory and delivers next day throughout the UK. Whatever your power transmission project needs, contact your local sales office today for project support!